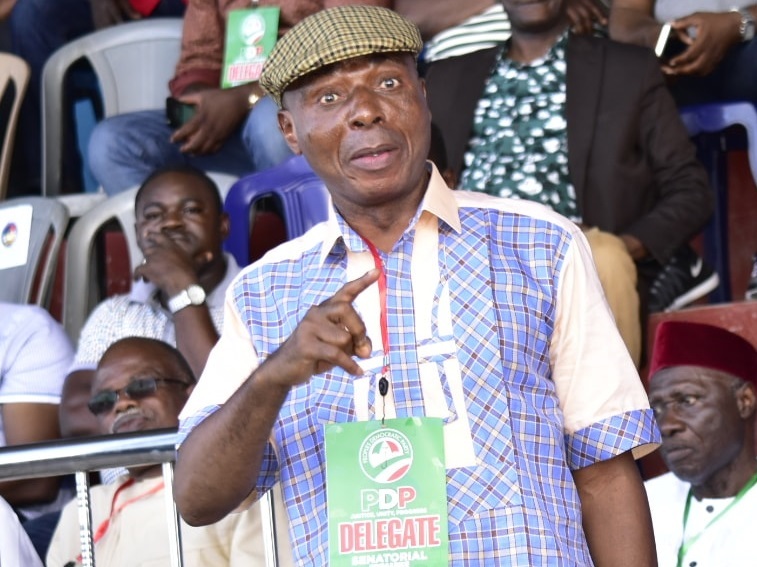 Senator James Manager, the senator representing Delta South district, was booed on Saturday by youth of the Peoples Democratic Party (PDP), over what they described as "I6 years of monumental failure" in the National Assembly. SaharaReporters reliably gathered that Manager was on a consultation visit to the residence of George Idodo Umeh, an Isoko South PDP leader, at Olomoro, when the aggrieved PDP youth booed him. A PDP youth from Isoko Local Government Area of Delta State, who gave his name as Gideon, narrated what happened. He said: "James Manager is a big failure and does not deserve the support and votes of Isoko people. Immediately we got the news of Manager's visit to Idodo Umeh's house, we the PDP youth in Olomoro stormed the place to listen to what he has to say. As soon as it was time for him to speak, we all started booing and shouting him down. It was an event that cannot be forgotten in a hurry. "All efforts by the host, Chief Idodo Umeh, to calm us down failed, because we overwhelmed everybody. For the past 16 years, Manager has nothing to show in Isoko. After electing him, he will run away and come back again after four years for votes. This time around, Isoko people are wiser. In fact, let me reveal our secret to you. All Isoko PDP youth have resolved before now that come this Saturday, February 16, 2019, Manager will be sent back home from the National Assembly, and he will be replaced by the immediate past Governor of Delta State, Dr. Emmanuel Uduaghan.” Confirming the incident, a PDP executive member in Olomoro ward, who attended the consultation visit, but preferred not to be named, said: "Senator James Manager has failed the people, especially we the Isoko people. For good 16 years, Manager can't boast of anything in Isoko. Manager was able to buy party delegates during our primaries; will he also buy the people's votes to win come this Saturday, February, 16, 2019? "Forget what you see in the public. I must open up to you that all PDP members will vote out Manager and replace him with Dr. Emmanuel Uduaghan. We are all tired of Senator James Manager. His case is very bad and if you watch very well, he is aware that he will fail in Isoko, hence he has decided not to campaign in Isoko nation. We the Isoko will be collectively saying ‘bye bye’ to Manager on Saturday.” Manager did not answer calls put across to his mobile phone for comments on the issue, but one of his canvassers in Olomoro community, who preferred not to be named, simply said "The PDP youth were sponsored and that's all I can tell you."